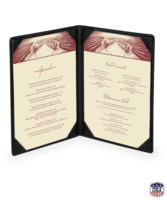 Our faux leather menu covers will provide your restaurant with upscale style at a budget-friendly price. 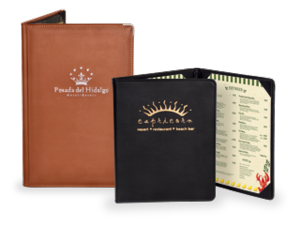 If you enjoy the look and feel of leather but don’t want the maintenance or cost of genuine leather, faux leather menu covers may be just what you’re looking for. Composed of a thick, soft vinyl material, these menu covers are designed to emulate genuine leather. The material is similar to the Naugahyde material used in expensive luggage and reclining chairs. Each menu cover is reinforced by a rigid, foam-padded board and leatherette lining, which the faux leather cover is glued and stitched to in order to hold firmly in place. Our faux leather menu covers are designed with your restaurant's unique style in mind. Each menu cover includes adaptable tabs to fit any menu size and style. You can choose from over a half a dozen different customization options, including menu size, color, viewing side count, and trim details. Your menu cover design will be completed with a gold, silver, white, or black foil stamp of your restaurant's logo and/or name. 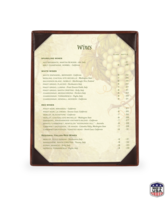 This menu cover style is perfect for any restaurant that wants to create an upscale atmosphere, but doesn't want to deal with the maintenance or costs of any more delicate menu cover materials. 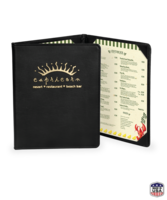 Faux leather menu covers are a classic choice for many types of restaurants. 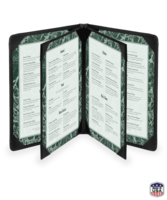 Once you invest in a set of faux leather menu covers, you won't need to worry about them for a long time. Their sturdy design and materials give them an average cover life of around five years or more. A faux leather menu cover is one of the easiest menu covers to keep clean. Its vinyl material wipes clean with a damp cloth, soap, and water. After cleaning them, be sure to wipe them dry. 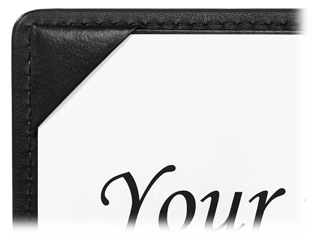 The size of your faux leather menu cover is entirely up to you. We provide you with seven base options to choose from, but if you would like a unique custom size, the options are unlimited. You can also choose from a variety of booklet-style designs including: single, double, three-view, four-view, and six-view. We provide you with a complete spectrum of ten unique colors for your faux leather menu covers. Colors range from earth tones like brown and tan to bolder options like red or turquoise. You’ll be sure to find a color to match the atmosphere and branding of your restaurant. Budget-friendly. 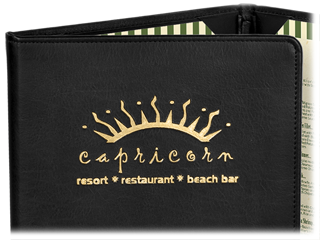 As one of the most cost effective menu cover options that you can choose, our faux leather menu covers are great for creating an upscale atmosphere for your restaurant without breaking your budget. Menu Shoppe has the lowest price online for this style of cover. Adding a fine leather appearance and feel to your menu covers does not mean that you have to spend a lot of money or constantly be worried about maintenance. 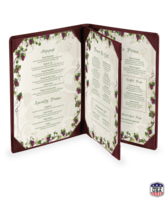 Our durable faux leather menu covers provide your restaurant with the elegant style it needs at a price you will love! Do you want the classy, luxurious feel of leather without the upkeep and maintenance of real leather? 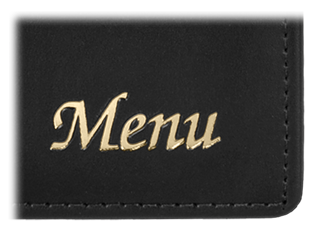 Try our faux leather menu covers!